Lucy and Ethel acquire a huge, walk-in freezer from Ethel's butcher-uncle, Oscar, provided they pay the fifty-dollar moving charge. Next, the pair orders two sides of beef from Johnson's Meat Company, unaware of the immensity of their request. Later that day, Lucy and Ethel watch with growing horror as deliverymen unload seven hundred pounds of meat at a cost of sixty-nine cents a pound, or a total of $483. Lucy's first notion is to glue the cow back together, but the deliveryman insists he can't take it back even if she "taught it how to walk again." Next stop is a local butcher shop, where Lucy tries to unload the beef on unsuspecting customers: "Are you tired of paying high prices? Are you interested in a little high-class beef? You want a bargain? I have sirloin, tenderloin, T-bone, rump; pot roast, chuck roast, ox tail, stump. We do everything ourselves. We rope, we brand, we butcher, we do everything but eat it for ya - seventy-nine cents a pound!" They promptly go out of business when the neighborhood butcher gets wise to their competitive tricks. In an effort to move the beef from the basement freezer into the unlit furnace before Ricky finds out about the $483 meat bill, Lucy accidentally gets locked inside, freezing into a "human popsicle." When Fred turns on the furnace to help thaw Lucy, the meat starts cooking, the aroma rising through the heating ducts. In shock and on the verge of tears, Lucy explains, "Just get a knife and fork and a bottle of ketchup and follow me to the biggest barbecue in the world." 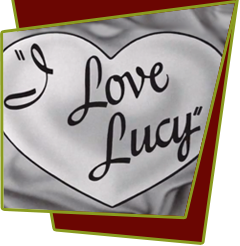 Special Notes: One scene in this episode is based on lucy's radio show, My Favorite Husband, Episode #90, "Selling Dresses". Barbara Pepper and Lucille Ball were great friends from their days as Goldwyn showgirls in the film Roman Scandals. Consequently, Barbara can be seen in many episodes with Lucy.